Breakups in the time of social media updates can be rough. Facebook is testing a new feature that will help ease the pain, without forcing you to unfriend exes or delete all your past posts. 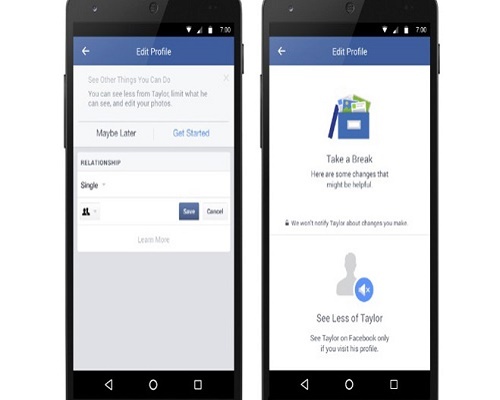 The new “Take a Break” option pops up when you make the breakup Facebook official. After you change a relationship status, you’ll be given the option to limit what you see about your ex and what they can see about you. The settings go both ways. You can also hide your own updates. With this option, your ex only sees new posts he or she is tagged in, or things posted publicly or shared with mutual friends. As Facebook has awkwardly discovered with its own memories features, sometimes the past is really painful. An edit option will let you go through all your old posts and block an ex from seeing them, or untag yourself from those smooching selfies you took in better times. “This work is part of our ongoing effort to develop resources for people who may be going through difficult moments in their lives,” said Facebook in a blog post. In the olden days, you might have burned a box of photos. That’s harder to do when photos are digital. This may not be as therapeutic, but it does have one big advantage: none of the Facebook changes are permanent. You can undo them at any time, which is great if you get back together, become friends or get nostalgic. Previous : RUMOR: Aquaman Villain Revealed?